Many cooking supply stores sell pumpkin-shaped ceramic bowls, but you can easily make your own bowls with real pumpkins. And you don't just have to serve pumpkin soup in these bowls; they're perfect for any appetizer, salad, dessert or another type of soup or stew. To make them, you'll need miniature pumpkins (about 6 inches in diameter), olive oil, salt, and pepper. The cooking equipment you'll need includes a paring knife, a pastry or basting brush, a sheet pan, and a serrated grapefruit spoon or a regular table spoon. To begin, preheat the oven to 350 F. Wash and dry the pumpkins, then cut the tops off each pumpkin as if you're carving a jack o'lantern. Grasp the pumpkin by its stem and pull the carved top off. Make sure you've carved a wide enough diameter in the pumpkin top to make it usable as a bowl. If not, now's the time to cut the opening a little wider. You can discard the pumpkin tops (note that they are excellent for composting). Using a serrated grapefruit spoon or a regular spoon, scoop the pulp and seeds out of the pumpkins, scraping as much of the pulp as possible off the inside of the pumpkins. 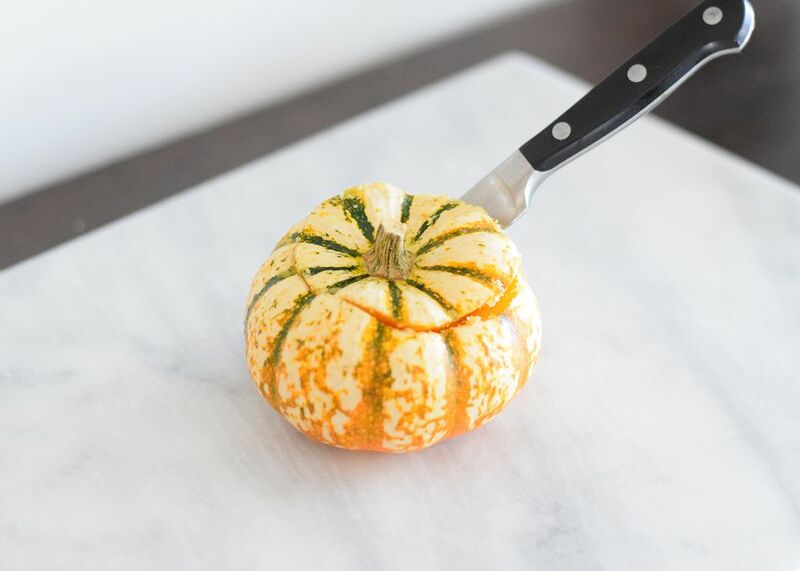 If necessary, use the grapefruit spoon or paring knife to cut away the inside of the pumpkin in order to make the top opening a little larger. This is time-consuming, but it's important that all the "guts" be removed from the pumpkin before proceeding to the next step. Brush the inside of the pumpkins lightly with olive oil and sprinkle with salt and pepper. Try to avoid getting any olive oil on the outsides of the pumpkins, as this can lead to searing or charring of the pumpkin skins when you bake them. This isn't a fatal error, but the bowls won't look as nice with burn marks on them. And oil drips can make the baking pan a little messier. 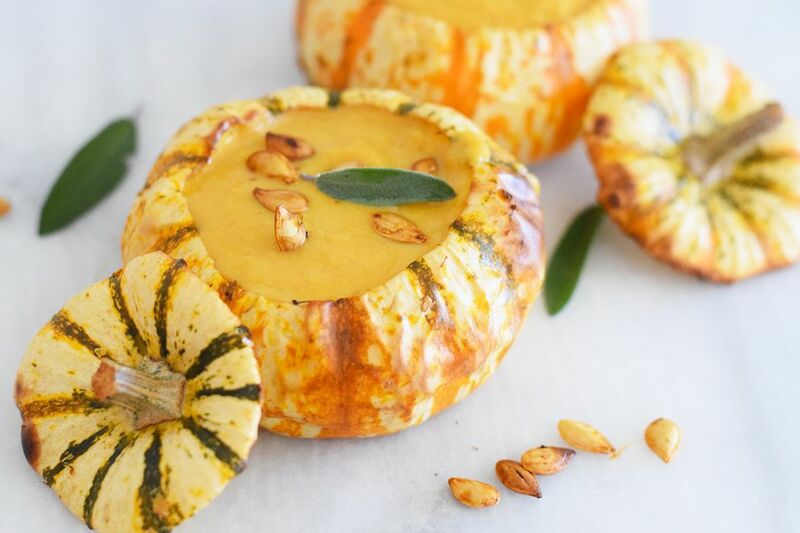 Note that if you're planning to serve a sweet soup or a dessert in your pumpkin bowls, you can substitute the salt with sugar in this step, and use coconut or a flavor-neutral oil like canola instead of olive oil. Your pumpkin bowls may bake a little more quickly if you're using coconut oil, so adjust your bake time accordingly. Place the pumpkin bowls on a sheet pan and bake at 350 F for 20 to 30 minutes, or until the inside flesh of the pumpkin bowl is tender when pierced with a fork (be careful when testing this, as the pumpkin flesh will be very hot). If you used coconut oil instead of olive oil on the insides of your pumpkin bowl, you might want to either reduce the temperature or reduce the baking time by a few minutes. Let the pumpkin bowls cool slightly before filling them with soup, or whatever dish you're planning to serve. And remember: the inside flesh of the bowls is edible and quite delicious.